More than $30 million in funding from New York state, Cisco, Dell and The Wegman Family Charitable Foundation will be used to launch MAGIC Spell Studios. The studios, which will be built on the RIT campus, will be used to commercialize computer gaming, film and animation and graphic design. This conceptual rendering is by hbt Architects. RIT is at the epicenter of a public- private partnership that could catapult the greater Rochester region as a leader in the rapidly growing digital media industry. More than $30 million in funding, including $13.5 million from New York state, $12.4 million from Cisco Systems Inc., $3 million from Dell and $1.5 million from The Wegman Family Charitable Foundation, will be used to launch MAGIC Spell Studios, a university program that will link RIT’s internationally ranked academic programs with high-tech facilities needed to commercialize computer gaming, film and animation, graphic design and imaging science projects. “We are thrilled that Gov. Andrew Cuomo and the state leadership see the economic development value in our MAGIC Spell Studios, and we are very appreciative of this extraordinary support,” said RIT President Bill Destler. 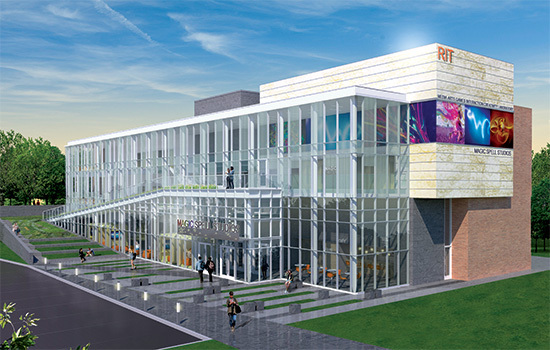 A state-of-the art studio, which will be located in a new building on RIT’s campus, is expected to create 35 to 50 jobs in the first five years, with a goal of 100 jobs over the next 10 years. More importantly, it will be focused on helping RIT students launch their own companies, propelling an industry that has been taking hold locally with entrepreneurial enterprises such as Darkwind Media, a company created by four RIT students that now employs 17 and is moving into the RIT Downtown Center at 40 Franklin St. as part of the START-UP NY program. Creation of MAGIC Spell Studios will make the Rochester region highly competitive for attracting and developing a digital media cluster. The digital media field takes advantage of increasing convergence between the film/animation and video gaming industries, visible by the tools and methods used to create such blockbuster films as the Lord of the Rings and Iron Man series, as well as others. On the gaming side, industry analysts are predicting that with explosive consumer demand for smartphones, tablets and other devices, the international games market will rocket past the $100 billion mark in the next three years to reach $102.9 billion by 2017. “This investment will open the door to limitless possibilities through MAGIC Spell Studios, and I am proud that our administration is helping to further RIT’s potential,” Gov. Cuomo said. RIT is a world-renowned academic leader in digital media fields. Among the graduates of its nationally ranked School of Film and Animation are several Academy Award winners. MAGIC Spell Studios would tap into the talented pool of RIT students to make production assistance available to independent and commercial filmmakers, allowing the region to take advantage of and create new opportunities for the state’s popular film and television tax credit program, which Gov. Cuomo has championed as an economic development tool. RIT already has experience in this arena, including placing students as camera production assistants for the Rochester-filmed portions of The Amazing Spider-Man 2. While original plans for MAGIC Spell Studios called for a 3,400-square-foot sound stage, a $1.5 million gift from The Wegman Family Charitable Foundation will enable university officials to more than double the size to 7,000 square feet. The larger space offers a wider range of learning experiences for students and entices independent filmmakers to use the facility. “The reputation of RIT film graduates’ on-set capabilities are second to none, and this initiative allows for the benefit of these collective talents to be available in one location to film productions, while at the same time giving these new professionals important experience and résumé building opportunities,” said Malcolm Spaull, administrative chair for RIT’s School of Film and Animation. One of MAGIC Spell Studios’ goals is to create local job opportunities that will give these talented graduates and others a reason to stay in the Rochester region, helping reverse what has been called “the brain drain” of local college graduates. “The MAGIC Spell Studios effort is focused not just on placing our graduates in existing studios, but rather on growing smaller studios and founding new ones, in line with the current industry trend moving away from a few large publishers toward several small and mid-sized independent studios that employ anywhere from five to 20 staff members,” said Andrew Phelps, founder and director of RIT’s Center for MAGIC (Media, Arts, Games, Interaction and Creativity), under which MAGIC Spell Studios would operate.